Releases like this have the indisputable quality to help people like me to reconcile with soft electronic music that usually is filed under idm. This Italian musician has assembled a soft track-list that walks on the tight rope suspended between quasi-ambient and post-classic/soundtrack music, I'm sure you'll get it after a few tracks. Eighties Warp alike sounding synths, soft pianos, string sounding sections, bleeps, electronic devices field-recordings and other kind of instruments cross the aural scene and enrich every single track of a series of arrangements that soften the journey during the listening. Track after track I've been positively surprised seeing what emphasis he has put on melody and on the song structure in spite of getting lost in the useless search of some fake avant-gardist coolness. What I've just said doesn't imply Obsil is sounding like a zillion of other electronic acts, infact I think he managed to put a personal touch in the recipe, but after having experienced "Distances" I think you will agree his primary interest was not exactly working on the experimental side of song-writing. Obsil songs sometimes have been developed in a quite uniform way, sometimes present many unexpected variations, but in most of the cases it could remind a strange hybrid of Lusine with Plone and Plaid elements cut with some neo-classical Murcof alike solutions. In its apparent simplicity "Distances" offers the example of a good and well pondered release where the aesthetic profile is submitted to writing soft, easy-listening, emotionally charged electronic tracks non based on rhythms. Nice work. I still haven't reviewed a release that Petit is back with a new one, it says a lot about the prolificacy of this French guy, but on the other hand I invite you to avoid thinking this over-abundance of works get worse release after release. I think the French artist fills the rank of musician like Aidan Baker who's average production has been quite good so far. On this new work Petit keeps following the route of contemporary neoclassic music processed through a laptop, nothing close to Fennez or Sakamato plus Alva Noto or Murcof, just harps, cello, violin, horn, trumpet. All of the instrumentalists involved in the recording have not been processed heavily, the majority of the effects used are reverb, delay and what I think has been a cut and paste re-assemblage of the tracks. As you can imagine there's some soft crackling, some other soft noises to color the final shape of every single suite, but everything has been done with a really gentle touch. If compared to the previous cd of Petit and friends, this one is way more abstract and cold in a spacey way, if Roger Eno and Lanois would assemble a new sonorization for the documentary on "Apollo. Atmospheres and Soundtracks" this could be really close to the result, even if it's much colder if compared to the atmosphere create on that album. Despite its dark profile this work somehow brings in a gentle overdose-experience, according to this comment it partially reminded me of some soft Nurse With Wound hybridized with a more neoclassic aesthetic, but that "floating ashore-feel" is still present and quite strong. The global listening is quite uniform and trippy and even thought not all of the tracks are on the same level the average result undoubtedly goes from interesting to catchy. One half of the harsh industrial band Snog, the provocative Australian musician David Thrussel finally comes back with another of his shrubby and scathing releases by which he's able to shrivel the most raving aspects of contemporary human history, most humans sometimes ignore, as well as to have a squint behind controller's curtains through the use of musical language inheriting elements both from EBM, techno and scattershot electronica, a plenty of references running on the razor-sharpened edge of conspiracy theories and political matters and by which he manages to move the listener's mind up without using any lyrics. The plot standing behind this new release entitled Full Spectrum Dominance ' issued by Ant-Zen in collaboration with the seminal Tympanik Audio -, like the ludicrous military doctrine inspiring the American Department of Defense according to which a joint military structure should achieve control over all elements, including not only the classical air, land and maritime warfare, but also information space (the so-called Cyberwarfare) and electromagnetic spectrum and what is known as Joint Vision 2020, the famous plan for world hegemony developed by Joint Chiefs of Staff and supported by DARPA, acronym for the Defense Advanced Research Project Agency, a funding body of the US Government and the Pentagon, mentioned as the fake client of this release, intended according to the fictitious words of a DARPA's officer 'to deliver to the men and the women working in some of the Pentagon's most challenging fields as inspiring soundtrack to their daily working life, but also to present to the general public information and a view hitherto unconsidered of some of the lesser known branches of our military' and the booklet included with this record explains the references of each track, alternatively quoting some Chomsky inspired anti-capitalist issues, the Hostmen of Newcastle upon Tyne ' being maybe the first example in human history of energy cartels controlling resources and inventing shortages in order to appeal to the unmerciful market rules, inspiring according Thrussel's words the nowadays cartels'¦ -, the manipulations of world bankers in order to generate illusions and hypnotize markets (The Wonderful Wizard of Ounce is definitively the funniest and most bitter title David could choose for 'affording' this theme!!! ), neocolonialism, the inner mechanism of the so called 'free market', contemporary fears about forthcoming future and other actual more or less paranoid arguments. His provocative joke seems consisting of wearing the mask of the controllers, spreading messages to the bovine masses in a witty and almost dramatic way, by using sounds as theatrical gesture and creating implicitly a possible soundtrack of our dark ages. From the musical viewpoint, Full Spectrum Dominance looks like an exhaustive summary of the previous breathings by the Black Lung, but I mostly prefer those tracks showing some ambience and atmospheric gears, such as the thoughtful and disquieting worried whispers of The Great Unconscious, an evocative collage of synthetic melodies standing as one of the best piece Thrussel had ever composed and which perfectly rendered the most buzzing divergence and the implicit imperfectness of any ordering supreme will, the disquieting beauty of the already mentioned The Wonderful Wizard of Ounce, the swarming concinnity of the bass intertwining some bizarre sounds in The Hostmen of Tyne, the dark sound granules of The Feminine Void which is going to carry your mind in the outer dumb spaces (!) and the gentle martial core as well as the stirred sounds on a disassembled march of The Neuroses of Nostalgia (another great immersive track! ), but the most ominous techno crunched sounds you're going to hear in other appreciable tracks ' more easy to recognize by all those listeners which already tasted Black Lung's previous records ' should be considered just as parts of a whole. Maybe Full Spectrum Dominance is not so epic as other releases, but in my modest opinion it's the definitive proof that Thrussel's sound forging skills as well as its provocative grip reached some interesting peak indeed! 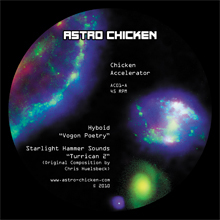 CHICKEN ACCELERATOR is the first release of a new German label called Astro Chicken. Dedicated to spaced out disco/electro sounds the label starts its journey presenting four cool tracks brought to us from four different bands: Hyboid, Starlight Hammer Sounds, Telebot and Sternrekorder. "Vogon poetry" by Hyboid has the task to start the dances and does it with an electro spacey upbeat tune. "Starlight Hammer Sounds" with "Turrican 2" sounds a little more robotic but always upbeat, with cool melodies and nice arpeggiator progressions. Telebot's "Disco dump" is a mid tempo with moog solos and alternates disco 70's atmospheres to dark atmospheres. Sternrekorder close the compilation with their "Geh lieber nie", which is the only song to have vocals and it's an upbeat song with 80's electro melodies and nice echoed German vocals. Sebastian HÃ¼bert of Astro Chicken Records did a great job gathering four bands that will be able to make you enjoy even more your galactic trips! I had not heard of Ben Frost before this disc came in the mail. This can best be described as electronic, although I would not compare it to the Orb or such, but rather, this has an experimental edge to it. At times it is glitch and noisy, while at others, peaceful and droning. I found it interesting that the last three songs take their titles from the lyrics of 'Disintegration' by the Cure, although none of them seem to have anything to do with that song (Peter Venkman does seem like it would be at home on a Ghostbusters soundtrack though). From the very beginning it is clear that this is not going to be just an easy listening album with the track 'Killshot' that has crescendoing pulses of music interwoven with strings. 'The Carpathians' has an unsettling claustrophobic feel to it that immediately gives way to the stripped down minimalism of 'O God Protect Me,' which in turn transitions to the noisiness of 'HÃ­bakÃºsja.' 'Leo Needs a New Pair of Shoes' is perhaps the most traditional song on this disc, sounding like something off a Narada sampler. Overall, this was a pretty good introduction to this artist and if you have someone who likes their experimental music not too experimental, this would certainly be worth checking out.